Harvey Daniels’ book titled Literature Circles (2002) describes a procedure to organize student book clubs in the classroom. A stimulating and productive discussion on a text requires participants to focus on many different things: overall content and form/style, particularly important passages, vocabulary, imagery, and the connections between the material and personal experience. The more we put into our discussions on all these specific fronts, the greater our comprehensive understanding and appreciation of the text as a whole. The idea behind literature circles is that students take on different roles and responsibilities as they are reading a text. Students are assigned different roles on different days (at random) and that no student will play the same role twice in a row. DISCUSSION DIRECTOR (a.k.a Curious George) – As the Discussion Director, your job is to develop a list of questions that your group might want to discuss about this reading. Additionally, it is your responsibility to make sure that all the other group members share their materials. LITERARY LUMINARY (the Buddha of the book) – To be LUMINOUS means to shed light. When you are acting in the role of Literary Luminary, it is your job to “shed light” on the significant and/or difficult, possibly confusing sections of the reading by bringing them to the attention of the group and reading them aloud. The idea is to help people remember some interesting, powerful, funny, puzzling, or important sections of the text. ILLUSTRATOR (our very own Bob Ross!) – As the Illustrator, your job is to draw some kind of picture related to the reading. It can be a sketch, cartoon, diagram, or flow chart.Any picture that conveys an idea or feeling you got from the reading. SUMMARIZER (You make it short, you make it sweet) – It is your job as a Summarizer to put it all together. You should prepare a brief WRITTEN summary of the reading, noting all the main events, interaction between characters and more. The other members of your group will be counting on you to give a quick (1-2 minute) statement that conveys the essence of that day’s reading assignment. VOCABULARY ENRICHER (like an apple picker) – It is your job as the Vocabulary Enricher to be on the lookout for a few especially important words in today’s reading. If you find words that are puzzling or unfamiliar, mark them while you are reading, and then later jot down their dictionary definitions). Not all words that you select need to be unfamiliar. Also seek out words that are repeated a lot, used in an unusual way, or key to the meaning of the text. CONNECTOR (You help connect the dots) – You are the Connector. Your job is to find connections between the reading and the world outside. This means connecting the reading to: your own life; happenings at school or in the neighborhood or news; similar events at other times and places; other people or problems; other books or stories; other writings with he same topic/theme; other writings by the same author. OBSERVER (you are the “eyes and ears” of the group, an informant) – You have no particular written assignment overnight other than to read through the assigned section of text. But you will be busy tomorrow! You are the secretary, informant, and synthesizer all rolled into one. You must record the participation and information covered and contributed by all the other group members. To synthesize means to bring together. You should try to gather together everyone’s contributions and ideas into a single understandable summary during and after the group discussion. These are the traditional roles and many have been updated to include Character Commandant, Mood Maven, Insightful Identifier, Symbol Sleuth, Mind Muser, and Reactionary Revealer. When I first started teaching my students would receive a color paper detailing the responsibilities of his or her role. Then, I threw out the reading and literature circle role log/worksheets. Technology has enhanced the literature circles strategy to another level with Google Docs and platforms like Padlet, Seesaw, and Flipgrid. Students can use these digital tools to share their reflections, connections, understandings, and discussions. Assigning each book group a classroom in Google Classroom, students can submit digital evidence in the form of Google Docs, BookSnaps and/or any other application chosen. Book selection – Students choose the books they will read. Chapters read – Students decide how much they will read for the next session. Digital platform used – Students decide which digital platform the group will utilize. 1. The Interactive English Notebook – Three years ago I became a devoted fan of the interactive notebook and since then, I have been creating my own content to support my students as readers and writers. The interactive notebook has become my textbook and portfolio of what students are studying and learning. Keeping my promise to the earth to use a little paper as possible, I only make photocopies of the interactive foldables for my students; worksheets have been eliminated and Google Docs and Forms have become tools for assessments, surveys, and responses outside of the notebooks. 2. Article of the Week – I assign little homework. In addition to independent readings outside of class (30 minutes a night Sunday – Thursday), the one outside assignment that I offer to my students is an article of the week. The “Article of the Week” was created by educator and author, Kelly Gallagher as a way to build prior knowledge and background. I assign students an article of the week every Monday and students have until Thursday to complete the close reading and reflection assignment. This year I am piloting a digital article of the week with Actively Learn. Actively Learn houses thousands of free articles and assignments or teachers can upload their own. Here is the thing about homework in my classrooms, students do not get graded on their homework, students earn game points for completed homework. Points equal priviledges. I talk more about the game platform next. 3. Classcraft Gaming Platform – Each student has an avatar and is on a team. The objective of the game is to gain as many points as possible to unlock privileges like extra days on homework, access to test questions, or extended bathroom breaks. Students work together, as well as individually, throughout the school year earning points based on quiz grades, homework completion, and classroom interactions. This game platform allows for positive peer collaboration and camaraderie, it is a motivational tool for most of my students, and students are rewarded for positive behaviors (and vise versa, lose points for negative behaviors). 4. Reading/Writing Workshop – Returning to my Teacher College roots, I am reinstating the reading and writing workshop in my classroom. As I mentioned prior, I am not teaching a book, I am teaching readers and writers. I want to offer as much time in my classroom for my students to read and write and foster a love of words. Although I do not teach in a block schedule, I will have reading workshop twice a week and writing workshop twice a week for a total of 80 minutes each a week for independent reading and writing, read alouds, and mini lessons. 5. Genius Hour – Friday is Genius Hour. Students will work on a project of their choice with the foundation that it has to benefit the “community.” I am thinking about class blogs for students to write monthly entries of their research and genius work to share with the world the amazing projects dreamed up. What are your everys or non negotiables? Please share or comments on this blog. Stories drive us. Characters and conflict drive stories. When teaching literature we want students to see dynamic characters for their complexity and understand their evolution throughout the story. When starting a new text with my students, the exposition has lots of great detail that can offer insight into the characters wants, needs, fears, and beliefs. 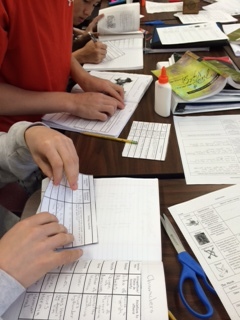 This activity can be utilized with any text for character analysis purposes. I have included the activity and directions below for my followers and fans. Laura Robb is just one of those published educators who I have come to trust for authentic teaching practices to improve student engagement and learning. So, when I found out that Heinemann was hosting a one day workshop with Laura Robb back in September, I immediately signed up. The workshop covered writing plans to support the development of analytical writing, practice strategies for creating claims and using evidence from texts to develop arguments, articulating criteria for a writing task and mini lessons to support what students should know, and addressed how self and peer revision improves student writing. Students need to ask themselves, “What do I know about this topic” before reading. If students don’t know anything they need to read slowly and thoughtfully, be prepared to reread parts and close read to make sense of words, sentences, and paragraphs. Writing and talking about what we read also is essential to share what we have learned from the reading. When I think about it, every state exam that I have seen over the past fifteen years for my middle school students contains a myth, legend, or folklore in the reading comprehension section. This genre is referenced everywhere, students need to read the different myths, legends, and folklore to identify the allusions, as well as understand the characteristics and structure of these types of text. Pose a question that relates to the text. Make sure the question has a yes and no response. Have students argue for the claim that their reading supports. Ask students to use their text to find evidence that successfully argues for the claim. Evidence can be details and logical inferences. For example: Can better care of land in the prairies reduce the negative effects of dust storms? or Can discrimination prevent a person from realizing his or her dreams? “Excellent” or “Terrific” is not helpful for revision and editing. This kind of feedback doesn’t really help improve writing. Teachers must show students how to respond to student’s essays. Start with a positive comment and point out a need with a question. By offering students examples, teachers build their mental model of what helpful peer editing looks like. Rather than a rubric, give student the criteria for a writing assignment, such as a analytical essay and give students two grades: the first grade is for the content; the second grade is for the craft, style, and writing conventions. Allow students to improve their grades by revising and editing their second drafts. For more information about Laura Robb you can go on her website to see the more than twenty books she has written and read through her monthly newsletters for more ideas for teaching reading and writing.